Tetraprimer Aqua water based primer Tetralux 0,75lt . High quality water based pri..
Tetraprimer Aqua water based primer Tetralux 2,5lt . High quality water based prim..
181 Super Spec 100% Acrylic Alkali-Resisting Primer . 100% Acrylic Anti-Alkali Substrate.It is ..
Benjamin Moore 182 Super Spec Waterproof Undercoat Solvent based 1lt. Solvent based, acryl..
Benjaminmoore 023 Fresh Start Ecological multipurpose undercoat 1lt.High quality ecological 100% acr..
Benjaminmoore 023 Fresh Start Ecological multipurpose undercoat 3lt.High quality ecological 100% acr..
Benjaminmoore 323 Kitchens and Baths Mildewcide Primer 1lt. A high quality, 100% acrylic primer..
Benjaminmoore 341 SPS Stain Killer Primer 0,75lt. A fast drying 100% acrylic sealer and stain s..
Emulsion primer Tetralux 0,75lt. Off white Tetralux emulsion primer for walls and plasters.It h..
Emulsion primer Tetralux 3lt. 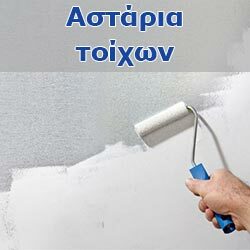 Off white Tetralux emulsion primer for walls and plasters.It has ..
Tetradur micronized water primer Tetralux 0,75lt. Transparent waterproof acrylic micronized sub..
Tetradur micronized water primer Tetralux 3lt. Transparent waterproof acrylic micronized substr..
Tetradur solvent based primer for walls Tetralux 0,75lt. Transparent waterproof acrylic microni..
Tetradur solvent based primer for walls Tetralux 5lt. Transparent waterproof acrylic micronized..